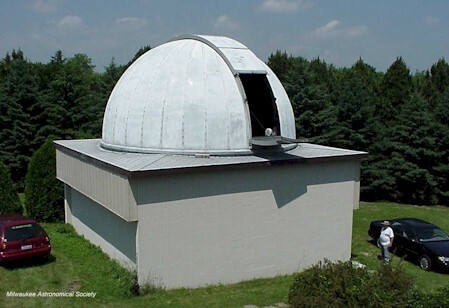 The "Z" in Z Dome stands for Cora Zemlock who was a long time member of the MAS who donated the money for a mirror which would become the Zemlock Telescope. This building was constructed to house that scope. She later left a large endowment fund that has supported the MAS for many years. The Zemlock reflector was the largest telescope on site. With a 26 inch mirror, it was built as an f/15, classical Cassegrain telescope with an equatorial fork mount. 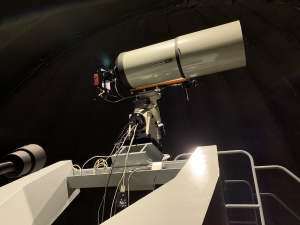 Located under a 22 foot diameter dome, this scope was computerized with high resolution encoders and motor drives which gave it "go to" capability via software. Briefly it was reconfigured in 2013 to be an f/3.4 prime focus CCD imager. The building and the dome were built by members of the society under the management and leadership of Gerry Samolyk. In 2015 it was replaced with a Celestron EdgeHD 14 telescope mounted on an Astrophysics GTO900 mount which sat on one of the forks. The imager is an SBIG model STT-8300. In 2018 the mount was upgraded to a GTO1600 and a bridge was built so it could be mounted in the center of the dome. This telescope is called the "G-Scope." 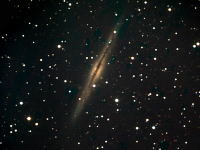 The telescope sits on the second floor and the first floor contains the club’s office, library, and control rooms.